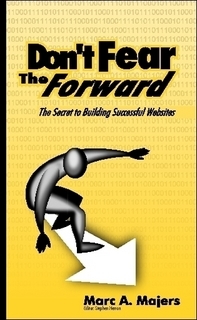 Marc Majers has published a book on a simple step-by-step process for building and launching websites, called Don’t Fear The Forward. He recently presented his perspective on the subject at CDPUG/GCPCUG Web SIG, which I attended. Marc used music (he also works as a music emcee), humor, and actual statistical data to back his information on usability and other measurable website criteria. Those who attended were lucky enough to receive a free ‘checklist’ which Marc stated is in the book, and is also a free download online. “It is important”, Marc said, “to show people thoughts, ideas, and the (proposed) process, early on, and to get feedback.” In his overview he pulled stat reports from eMarketer, PEW Internet’s research on desktop to tablet to mobile browser comparisons, and offered resource links to information by web champions like Jakob Nielson, and other industry-relevant educational and government sites on usability, CSS, and HTML 5, and recommended the use of surveys, which are all important for support in building a website. The checklist had steps for planning a website project, and each step was a separate category with tasks to do. Necessaries covered included defining your site goals and determining your audience, mapping out your site in a wireframe and finding logical places for things on the site and a way to navigate to them. It is a good idea to put together a web committee to assist in the process from concept to completion. The content for the site comes later on in the process. How are you going to engage your users once they reach your site? Marc spoke from a wealth of experience, with expertise in usability testing, working within the high selling environment of an online insurance company, and in a creatively-demanding arts institution with a diverse audience. As with most web related topics presented today, he touched upon the use of focused searched engine keywords, SEO (optimization), SEM (marketing), SMS (messaging). Have you thought of acquiring an email source provider for managing and sending professional, scheduled email campaigns, as a next phase? It is key that once a site is built following guidelines, like those outlined in Marc Majer’s book, it must be continually optimized for relevance and performance. This may be the website building manual you have been waiting for. You are currently browsing the Janet Dodrill's Blog blog archives for December, 2011.